In only five games in the NFL since 1940 have two teams played to a tie without scoring a touchdown. 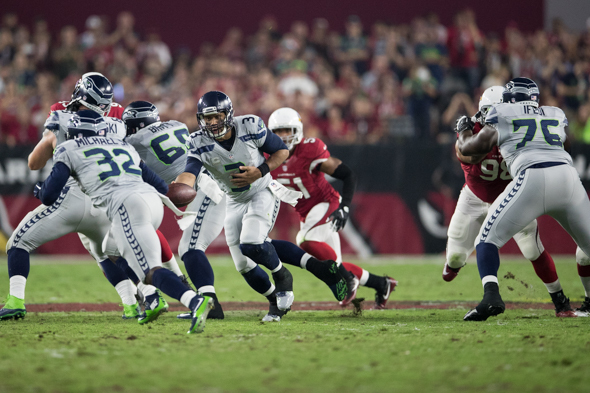 Seattle vs. Arizona Sunday night was the first such contest to reach overtime. One of the first statements out of Seattle coach Pete Carroll’s mouth Sunday night summarized how baffled he was over the Seahawks’ unlikely 6-6 tie with the Arizona Cardinals at University of Phoenix Stadium. Little wonder. Discounting soccer, human brains (American ones, anyway) are not programmed to process ties. Before the Seahawks and Cardinals knotted after four dramatic quarters and an epic overtime, the NFL’s last tie was in 2014 when Carolina and Cincinnati stalemated at 37-37. The NFL instituted its current overtime rules in 2012. Since then, only four games have ended without resolution. The 49ers and Rams drew 24-24 Nov. 11, 2012, and the Packers-Vikings game Nov. 24, 2013 deadlocked 26-26. Then came Cincinnati-Carolina two years ago and now we have Seattle 6, Arizona 6. No one knows when we’ll see anything like that one again. Between 1920 and 1973, 258 NFL games ended sans resolution, including a record 17 in 1920 when 0-0 contests were not uncommon. But since 1974, when the league introduced its first version of overtime, there have been 21. Subtract the four since 2012, and only 17 others since ended without a winner or loser. Until Sunday night, the Seahawks never played to a tie. The New England Patriots, to cite one example, played to a tie nine times as a member of the American Football League (1960-70), but not one since joining the NFL for the 1971 season. The Chicago Bears played in 42 ties between 1920-73, but haven’t played once since. Jacksonville and the Houston Texas remain utter strangers to tie games. What should have perplexed Carroll even more than a tie is the fact that since 1940, the first year for which relevant data is available, there have only been five games – including regular season and playoffs, and also including regulation and overtime – that ended in a tie without either team scoring a touchdown. As you can see, Seattle-Arizona is the lowest-scoring tie since Nov. 5, 1972, when St. Louis vs. Philadelphia ended 6-6 at Veterans Stadium. Beyond that, only one other tie since the 1970 merger ended with neither team scoring in double figures. That was the 7-7 draw between Washington and the New York Giants Nov. 23, 1997. Colleague Art Thiel wrote late Sunday that even a game without resolution can become a thoroughly riveting spectacle. Seattle-Arizona had the added benefit of featuring one of the five rarest outcomes since George Halas introduced the T-formation more than 75 years ago. Wilson “healthy,” but . . .
Carroll and QB Russell Wilson were both asked about Wilson’s lack of mobility Sunday night. Wilson had one rushing attempt on a third-and-one from the Seattle 26-yard line in the first quarter. The Cardinals dropped him for a two-yard loss. Asked about Wilson’s immobility, Carroll became animated. “I don’t know how much harder you can ask a guy to play,” Carroll replied without exactly answering the question. Wilson insisted nothing was amiss, even though he hasn’t been the same quarterback since a right high ankle sprain in Week 1 and a sprained MCL in his left knee in Week 3. Maybe so. But in the first 64 games of his career (through 2015), Wilson failed to throw for a TD or run for one only six times. In eight other games, he both threw a TD pass and ran for one. This year, Wilson has already played three games without a passing TD or a rushing TD: Sept. 18 vs. the Rams, Oct. 16 vs. Atlanta and Sunday at Arizona. Arizona’s Chandler Catanzaro (24 yards) and Seattle’s Stephen Hauschka (28) missed game-winning kicks in overtime Sunday night. The last game in which opposing kickers both whiffed from 29 or fewer yards in OT occurred Dec. 24, 2005, between the Falcons and Buccaneers. Atlanta’s Todd Peterson (a Seahawk from 1995-99) had a 28-yard attempt blocked at the 13:34 mark. Then Tampa Bay’s Matt Bryant missed a 27-yarder at 10:08. After three punts, Bryant hit a 41-yard FG with 15 seconds left to win the game for the Bucs. In 41 seasons, Seahawks’ kickers have missed field goals of 30 or fewer yards 26 times. Only two of those misses occurred in overtime games and Hauschka shanked both. His 24-yard attempt Jan. 1, 2012 near the end of the third quarter was blocked. That also came against Arizona, in a 23-20 OT loss. So what happened Sunday night makes Hauschka the only kicker in Seahawks history to botch a field goal attempt of less than 30 yards in an overtime period. That was really a horrible performance by the offensive line! Penalties killed multiple big plays, Wilson was harassed almost instantly after the snap.